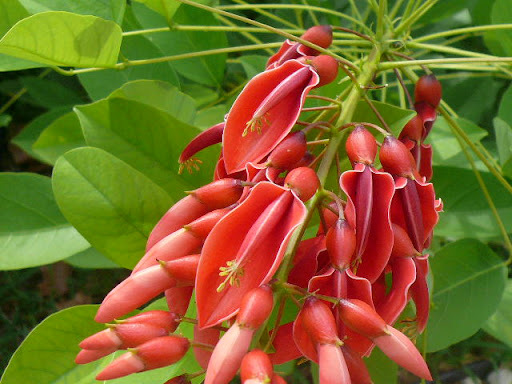 UPDATE: Meet Erythrina crista-galli, also commonly known as the Coral Tree. In climates with no freezes, it's a big tree. In places that freeze, it grows and flowers then dies back to the base until summer returns. Now we'll try to propagate seeds in Florida to see how they compete with the mothership. Auntie Dee, seeds are on their way! We thought we had identified our plant as an Australian coral pea, Kennedia rubicunda, but the more educated minds that are asked to consider the mystery (Mounts Botanical Garden, The Palm Beach County Extension Service, a waiter in FL with a green thumb and an iPhone, and also very big books about plants), the less certain we are of its origins. But, he's now officially a celebrity in Florida...and looking a bit yellowish-green around the gills in Texas (29 straight days above 100 degrees). Since one expert guessed it was a Texas plant, I'll try to contact a Texan expert soon and see if there's an answer here!